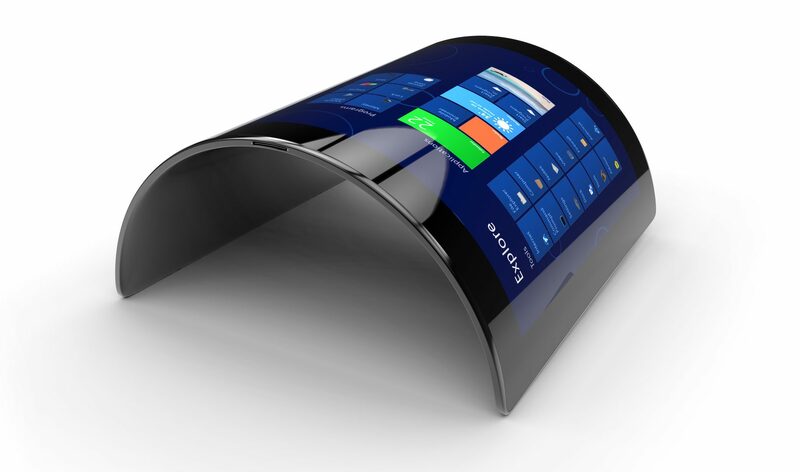 Light Polymers has used our proprietary lyotropic liquid crystal technology to create a Direct-Coatable Circular Polarizer for Foldable OLED displays. Other display applications include Curved LCD, Privacy Displays, and Micro and Mini LED. Borderless displays with an edge-to-edge screen, one of the major advances in Apple’s iPhone X and Xs, use what is called a “Flexible Display,” as it can wrap around the edge of the smartphone, and it is widely used in Samsung’s Galaxy smartphone offering as well. 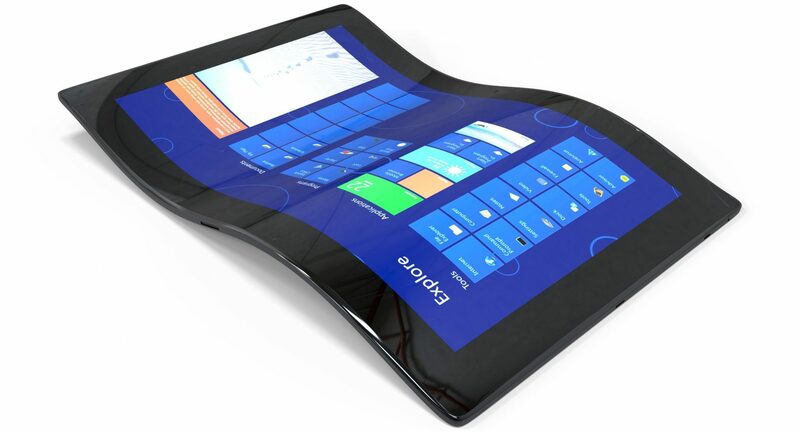 Flexible display components were just the first step on the path to fully foldable displays. Light Polymers is now perfecting the foldable version of this circular polarizer that is thinner than any current competitive offerings. This technology pushed the industry one step closer to making the foldable displays being introduced today. Light Polymers’ thin and durable coatable polarizer for foldable mobile devices is expected to be introduced in October 2019. 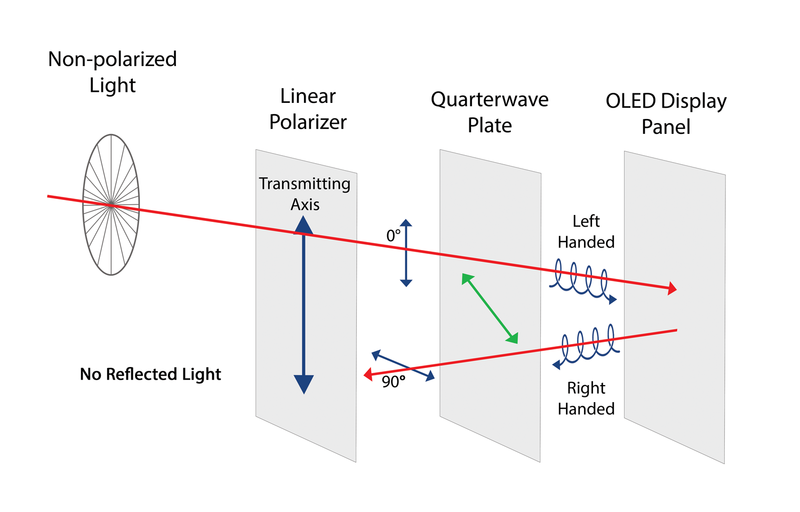 When testing films for Flexible or Folding displays, the film must meet the static bending test with no deformation. Directly coating our polarizer on PI cover film or retarder film solves the deformation issues that PVA based polarizer films experience after the bending test. 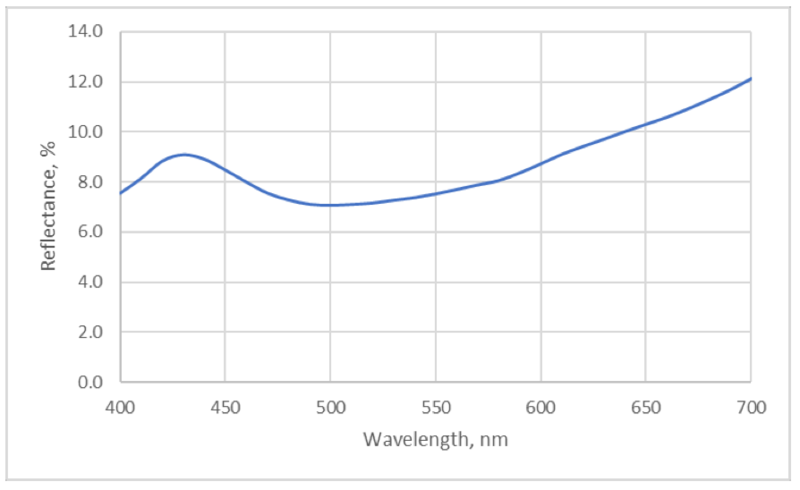 Light Polymers’ Grey Polarizer sample has passed initial bend tests and meets the minimum contrast ratio after successfully being directly coated onto customer’s compensation film. E-type: absorption axis perpendicular to coating direction. Small molecule units undergo face-to-face aggregation into stacks, then stacks are aligned by sheer force. O-type: absorption axis parallel to coating direction. Rigid polymers are aligned by sheer force. 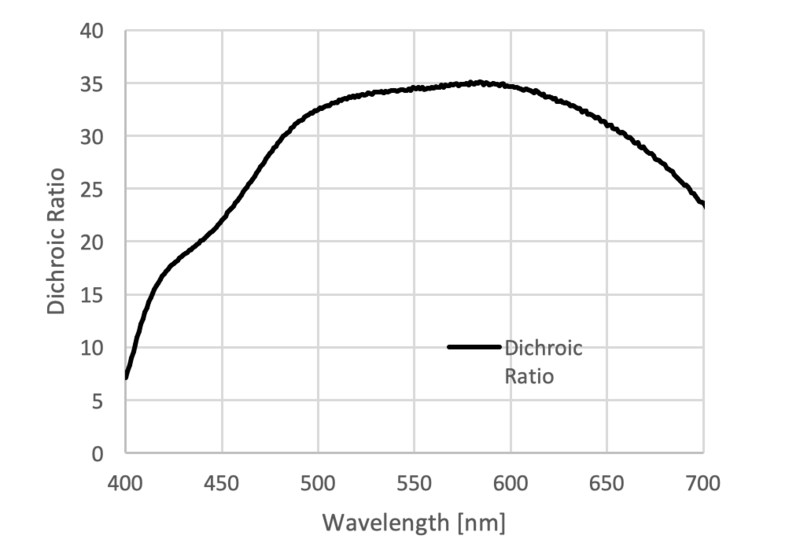 Chromophores diffuse into polymer coating layer and are aligned by neighboring polymer chains. 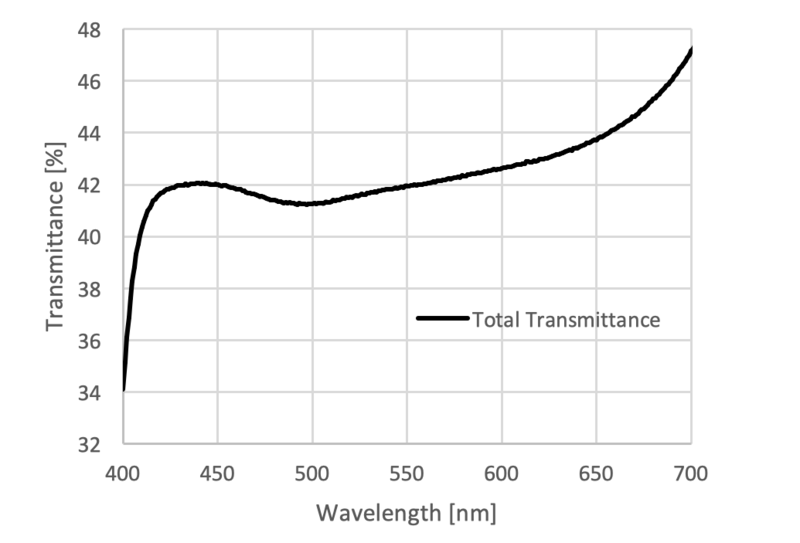 Sheer-coating of lyotropic liquid crystal solution of PP01 polymer to form aligned polymer, transparent in visible wavelength range. 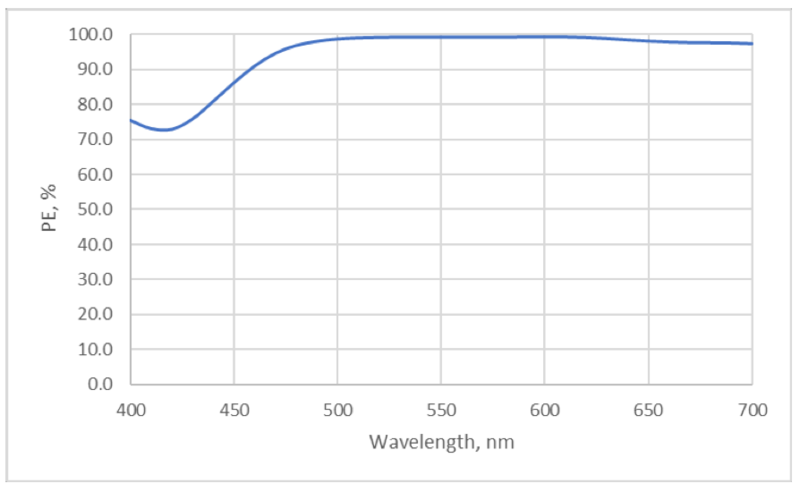 Doping step results in diffusion of chromophores into polymer layer. Chromophores are aligned by neighboring polymer chains. Certain salts in doping solution stabilize the coating. 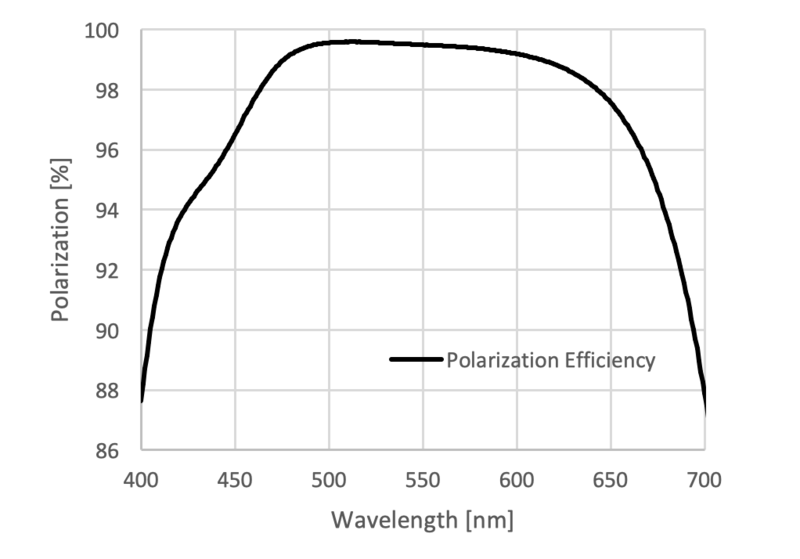 Circular polarizers used today are made of two films: a standard linear polarizer and a “1⁄4 wave plate” compensation film with reverse dispersion of retardation properties. 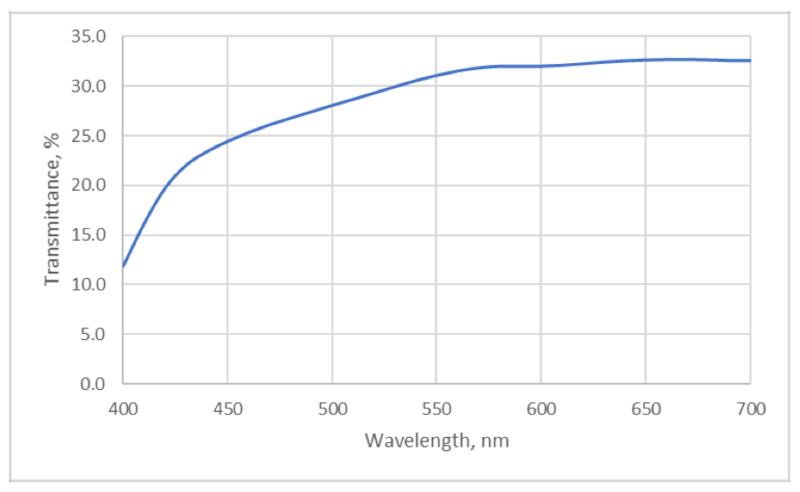 Light Polymers’ patented films are more durable during fold tests due to proprietary water-based chemistry and the elimination of fragile plastic substrates. 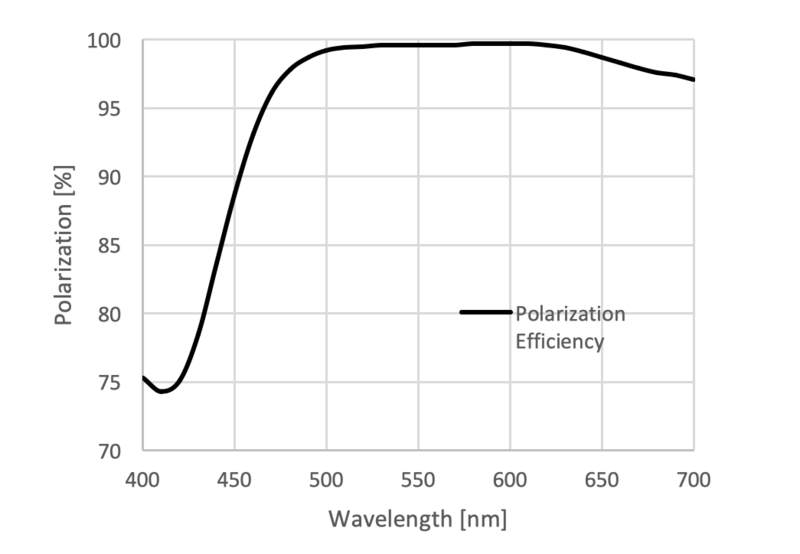 Polarizers developed by Light Polymers also eliminate costly extra film components while simplifies the overall manufacturing process. 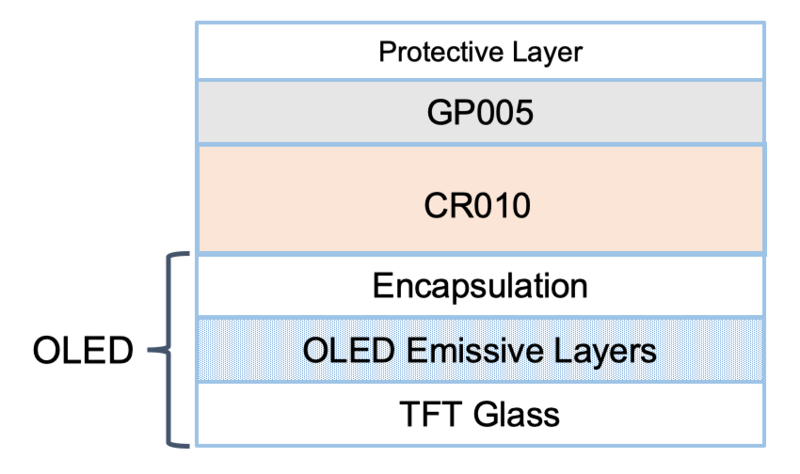 Transparent, high refractive index polarizer materials enable next-generation display technologies with higher light efficiency at a lower cost. Other applications for this technology include flexible and foldable displays, curved LCD, and privacy displays. Circular Polarizer is an optical film or coatings to cancel the reflected light so the user can see the image. 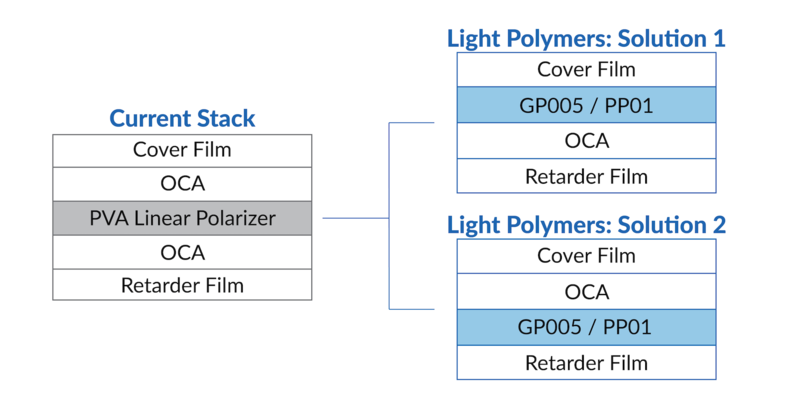 The technical development objectives or Light Polymers’ Polarizer is to have the thinnest total stack by integrating the cover film, retardant film, polarizer film and adhesive for an all-in-one film solution. Technology demonstration, by laminating two separate samples. 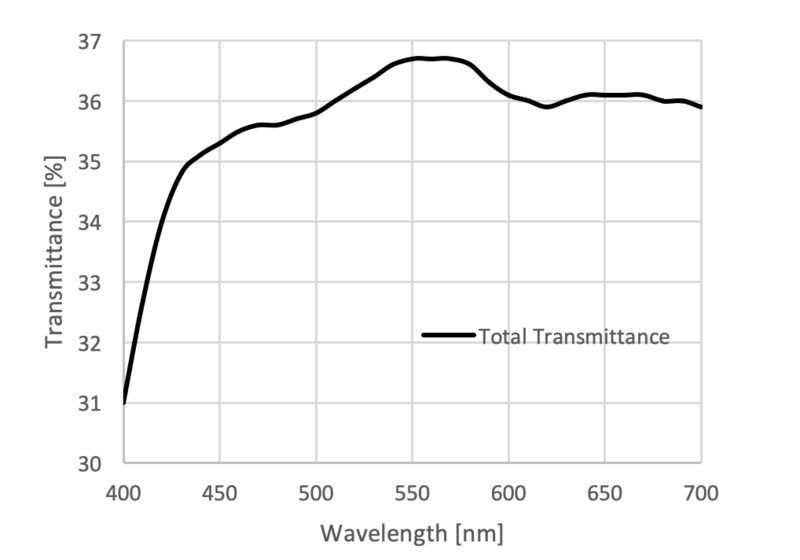 Reflectance measured by placing sample on mirror. * Passivation to render the coating insoluble in water. 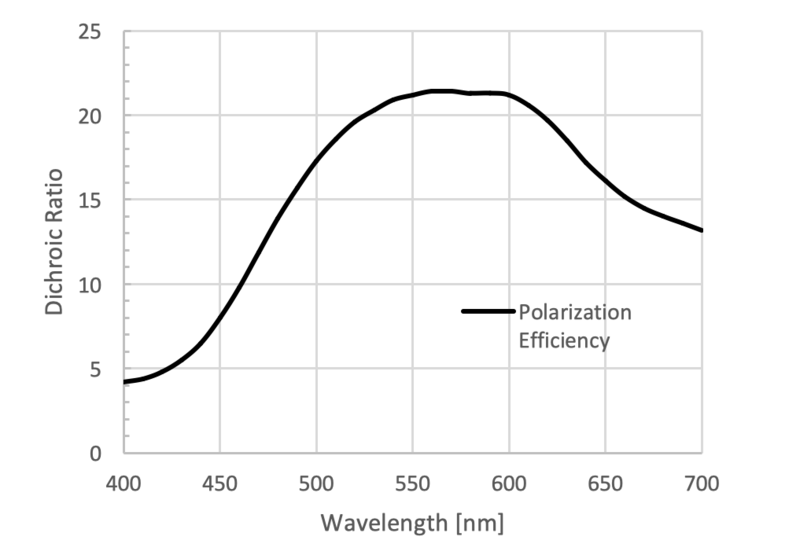 Conventional circular polarizers use a polarizer film laminated with an adhesive layer to both the ¼ wave retarder film on one side and the cover film/glass on the other. 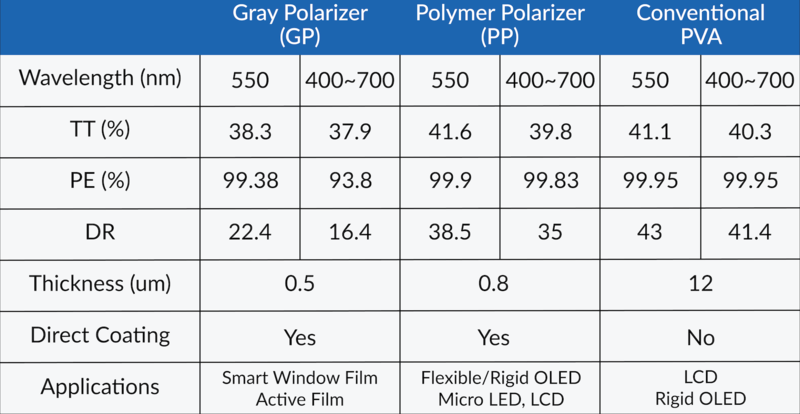 Light Polymers’ coatable polarizers enable two new solutions, only possible with direct-coatable polarizers: one where the polarizer layer is coated directly on the cover film/glass to then be laminated to the retarder film, and another where the polarizer layer is coated directly on the retarder film to then be laminated to the cover film/glass. Both new solutions are thinner than the conventional stack, and allow freedom to design manufacturing processes to suit the specific needs of the customer. 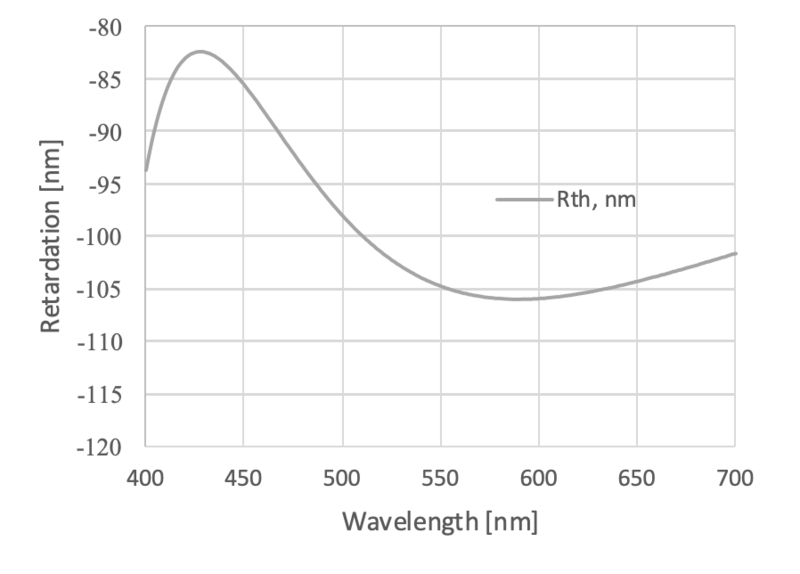 In-plane retardation R0 and out-of-plane retardation Rth for 3.7 mm thick CR010 coating shown below. 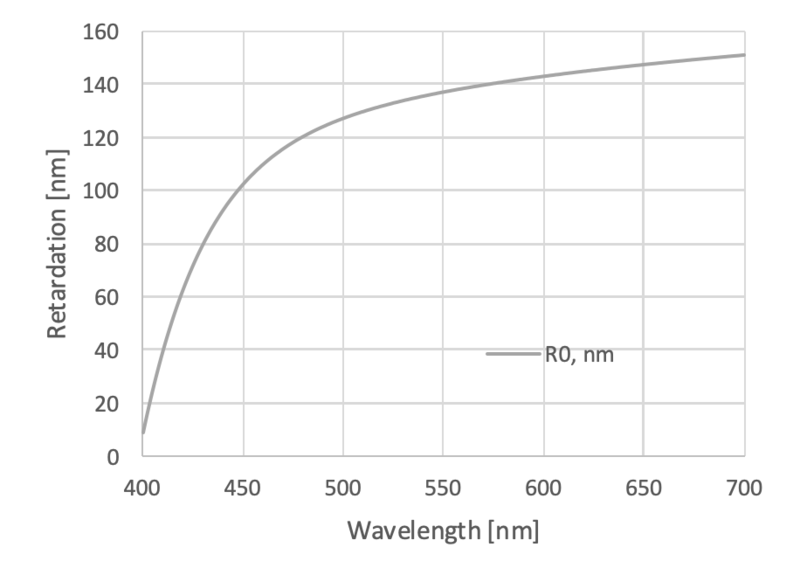 R0(550nm) = 137.1 nm. In-plane retardation R0 exhibits reverse dispersion. Coating thickness can be adjusted up or down. R0 and Rth depend linearly on thickness. Can be coated on an LCD panel or OLED panel.